I watched a TV special about these carpets just the other day. They come from three areas, Ako in Hyogo prefecture is most famous. Nabeshima and Sakai are next. Ako was also famous for its salt production and quite a rich city. These carpets came into fabrication at the Meiji- and Taisho-Period. They were made from cotton, since wool is not suitable for the Japanese climate. The threads are quite long and make a comfortable cushion to sit on. The carpets came in the size of a zabuton cushion or the size of a tatami and could be used for the tea ceremony. Many dantsuu could be placed in a great temple hall for celebrations, to have the visitors sit more comfortable and warm in winter.
. . . CLICK here for 緞通 Photos ! Nabeshima Dantsu is a traditional cotton fabric carpet designnated as an offering to shogun family from the Nabeshima clan during the Edo era. The tradition is herited to nowadays. Its tightly hand-knitted cotton-thread of excellent quality, using old weaving tools, presents your naked feet solid, elegant and comfortable touch. 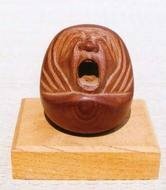 I have self-confidence that I am one of those few artists who make the modern Nabeshima Dantsu that can match today's life style, yet maintaining the traditional feature. 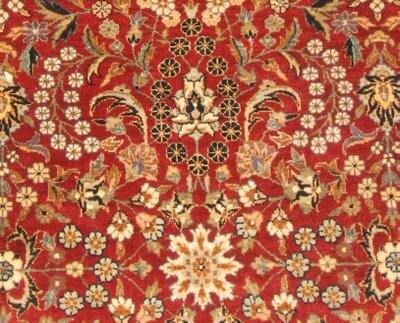 Mostly used for carpets from Persia, China and other Asian countries. sanjuu ichinen gata 三十一年形　31年形 さんじゅういちねんがた　"pattern from the year 31"
IN olden times woven rugs were not known in Japan. The wealthy classes of Japan covered their floors with grass, over which they spread the skins of animals. The poorer classes had not even skins, but only reeds or straw. 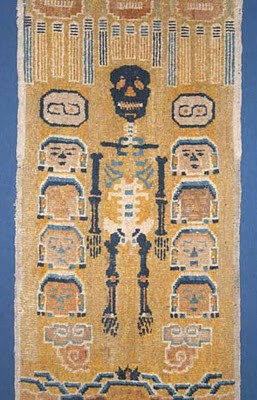 About four hundred years ago silk and wool rugs were introduced into Japan from Persia, China, and India. For a time the Japanese imitated these rugs, but later the industry ceased. Since the opening up of the country, however, rug-weaving has prospered, and the introduction of fine cotton yarns of uniform quality has increased greatly the growth of all textile industries. The modern Japanese rugs are made of cotton or jute, and are used extensively in the United States in summer homes. In the towns which produce these rugs little children may be seen busily engaged in weaving, their small fingers being very deft at this work. 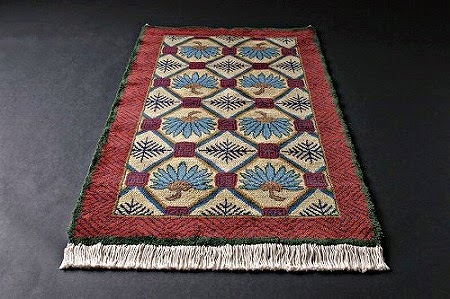 The chief colors employed by the Japanese in their rug-weaving are blue, white, and sometimes a beautiful pink. 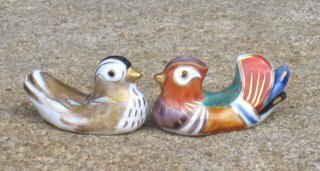 In weaving, designing, and coloring, as in everything else the natives do, their exactness of finish and thoroughness in detail are noticeable. The Persian designs which were once reproduced in Japan are now supplanted by designs purely Japanese. The dragon is a favorite design in some of the older rugs. The Ako City Tabuchi Museum of Art displays artwork donated by the Tabuchi family, a family that successfully engaged in the salt making business during the Edo period. The collection includes Japanese paintings, calligraphy, tea ceremony equipment, and marriage ceremony artifacts. In addition, there is a wide selection of tea ceremony equipment which are displayed according to each season. • Two felts from the Shoso-in Treasure House, Nara, Japan, 8th century. 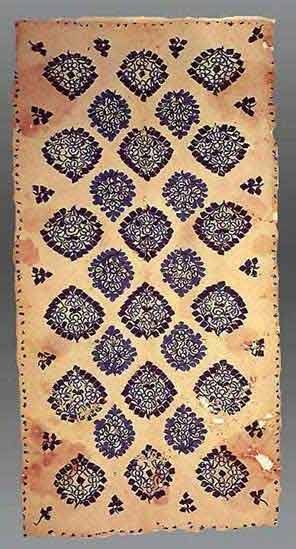 Given the description of felts in early texts, it is probable these two pieces are Mongol pieces, possibly used as door covers on the yurts or tents. • A fabulous example of a felt that may very well be Mongol also. The aesthetic is very refined. 8th century, Shoso-in Treasure House, Nara, Japan. A detailed 13th century account of Mongol yurts adn their felts, quoted by Bertold Spuler, in 'The History of the Mongols', notes that embroidered "birds and beasts" were featured in the designs of Mongol felts. Although it is in our homes all year, we feel the warmth from it most in the winter months, especially in Japan, when you sit on the floor and have an insulating carpet on the tatami mats. Ooh, I like that haiku! first line: long, but every word works. It is a very interesting reading. For the observer, meditation and mind have a very puzzling almost vexing relationship. It is so well brought out by Gabi. between morning light and say, late afternoon or early evening light, for me, distinguishing makes it more vivid... but of course, I'm not the poet! On that first line, I feel, as I've said elsewhere, that every word in it is working, which is why it works as a whole, in spite of its length. That said, I hink "winter" is the most expendable word of the three. while it does identify the season, this may mean more to the poet than it does to the reader, and that's usually a sign that it can go. Once again, though, I like the line, and the poem, as is. Interesting that you put it this way B. I'll use this as a measure from now on.